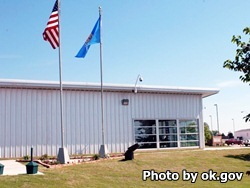 Clara Waters Community Community Corrections Center is located in Oklahoma City, Oklahoma. It is a community treatment center that houses inmates who are transitioning out of prison. The maximum capacity of Clara Waters Community Corrections Center is 292 inmates. While incarcerated here offenders can earn a GED and receive substance abuse treatment through a 4 month program. The transitional program offered at Clara Waters Community Corrections Center is a 100 hours program that is offered to inmates who are within 60 days of discharge, or are within 60 days of work release eligibility may participate in the program. The goals of the transitional program are to provide inmates with a foundation to obtain employment, improve their confidence in dealing with daily life, and to help inmates re-establish themselves into society.